Does it scare you when a favorite, once-small vendor gets big and starts adding products and changing pricing structures? BI market disruptor Qlik is clearly going through such a maturation, but that doesn’t mean it has lost sight of its roots. Qlik Sense Enterprise 2.0. Due in June, this is the first major upgrade of the self-service, data-visualization-oriented product the company introduced last year. Qlik Sense Cloud. Previously in beta, Qlik Sense Cloud was made generally available on Monday as a free way to share Qlik Sense Desktop analyses with up to five users. Later this year Qlik will add paid cloud service levels that will give you the ability to create analyses in the cloud and to share them with more than five users. Qlik Sense Charts. This cloud service lets you embed interactive charts – including the underlying data – into Web sites. Qlik DataMarket. This cloud-based resource will enable any Qlik customer (cloud or on-premises) to bring vetted third-party public data and syndicated data into analyses. Anthony Deighton, CTO, introduces the Qlik Analytics Platform. Qlik also announced the Qlik Analytics Platform, a developer platform, on which the growing portfolio will rest, but don’t think of all this as a sprawling BI suite. In fact, Qlik is becoming even less IT-centric, slowly evolving away from QlikView, the product that got it where it is today – 34,000 customers, millions of users, and $557 million in revenue last year. The product of the future is Qlik Sense, which is more visual and self-service-capable than QlikView, with less scripting required. 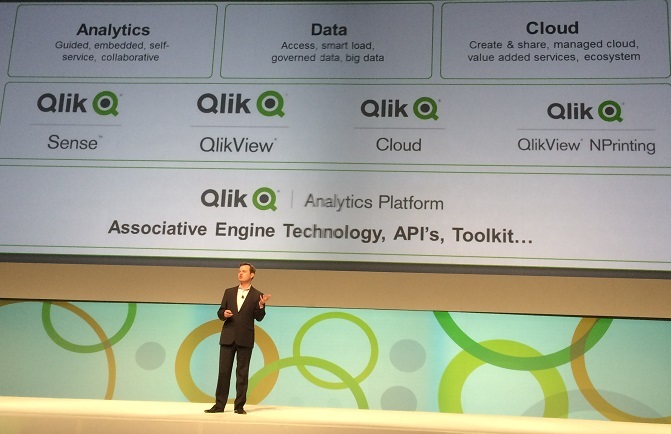 Think of the Qlik Analytics Platform as the development bridge between the two products and into cloud services. The platform bundles up the vendor’s QIX in-memory indexing engine (the underpinning of data-exploration within QlikView and Qlik Sense) along with data-mashup capabilities, APIs and a visualization toolkit to give developers a platform of their own. Qlik customers can work in QlikView, Qlik Sense or the new Qlik Analytics Platform, but there’s no requirement to buy or use it all. Long-time customers tell me in only makes sense to move business users to Qlik Sense. Power users can keep doing their development, admin, and management work in QlikView, but that work will eventually transition to the Qlik Analytics Platform. There are multiple releases of QlikView still on the roadmap, so die-hards needn’t worry. But Qlik Sense is clearly the go-forward product. One change introduced with Qlik Sense wasn’t entirely a hit, and that’s token-based licensing that can be allocated per-user or based on access time. Several customers here in Dallas said the approach can be confusing, making it hard to predict costs — particularly in embedded and extranet scenarios where you can’t predict how many users you might have. Qlik says it has heard these complaints and intends to address them with new licensing options. The move to a platform approach is absolutely necessary if Qlik and its customers are going to transition to Qlik Sense and, over the long haul, into more cloud deployment scenarios. Sometimes maturation brings growing pains, but Qlik is going about these changes methodically and customers I spoke to here are happy with what they describe as a clear and credible roadmap. Qlik is evolving into a bigger, broader company, and the platform strategy is binging more connectivity and data-management options. The new products and services are aimed at providing options and flexibility, not creating the next legacy suite of the kind Qlik has been known to disrupt.